Making homemade chicken stock can seem like more of a chore than it is actually is. There are tons of recipes and techniques out there, all trying to create a clear, strong stock. It is very easy to over think chicken soup making. The truth is that if you simply sautÃ© some chicken parts and onions together until brown, add some water and simmer for a while, you while have a stock that will knock the pants off anything you can buy in the store. Cutting the chicken parts up and sauteing them will give the stock a rich flavor and cut down on the cooking time. Chicken stock serves as the backbone for so many dishes, and a good stock will give them new life. If you buy anything other than boneless chicken breast, you will inevitably end up random chicken parts–chicken backs, ribs and carcasses. Throw all these parts into a large bag and stick it in your freezer. Next time you have a bit of free time, pull this bag of treats from the freezer and cook up a pot of stock. Of course your chicken part supply doesn’t always match your schedule. If this happens, whole chicken legs can make for a good soup. The legs are a good mix of bone, meat and fat–everything needed for good flavor and body. Cutting up the chicken parts into smaller pieces helps you extract more flavor. Start by breaking the chicken apart at the joints. Since you are going to be cutting through bone you will need a clever or hefty knife. Be careful! Split the breast in half. Hack the back section into 3 or 4 sections. Half each of the wing pieces. The legs and thighs are the toughest to cut since they have the largest bones. Hack each in half, if you can. There is a good chance you are going to end up with more stock than you need. We ended up with 6 quarts of stock and were definitely sick of soup by the time we were down to the last quart. Luckily stock is easy to freeze and keeps well. Line a container with a quart or gallon zip-lock bag and ladle in chilled soup. Throw the bags in the freezer and they should be good for 6 months. You may see the term stock and broth being used. While they tend to be used interchangeably, they do mean different things. Broth is made from boiling just meat while stock is made from simmering bones, meat and all of those weird bits like giblets. 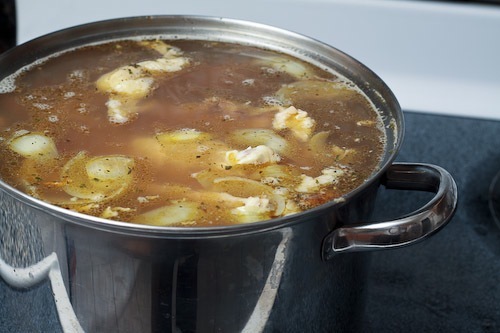 The addition of the bones gives the soup more body and is responsible for turning the stock to jello when it is cold. They can be used interchangeably, but real stock will have more flavor and body. Note: There is no hard number for the chicken to water ratio. Aim for 1 quart of water to one pound of chicken. If you have a good mix of bone and meat, you can get a higher water to chicken ratio. Heat the oil in a large pot, make sure it is large enough to hold the chicken and water. Saute the onions for 2 to 3 minutes until softened. Transfer the onions to a large bowl. Add half the chicken pieces to the pot and saute until no longer pink, about 4 or 5 minutes. Transfer the chicken to the large bowl the onions are in. Saute the other chicken pieces and then add the onions and chicken pieces you set aside back into the pot. Cover the pot and reduce the heat to low. Cook for 20 minutes. The chicken will release a lot of juices. Add the water to the pot, make sure there is enough to cover the chicken. Also add the bay leaves and salt. Turn the heat to high and bring to a boil. Once the water reaches a boil, reduce the heat so that it is just simmering. Cook for at least 30 minutes. If you can, let it go for longer. Strain the soup into a container and discard the solids. Any meat left will on the bone will be pretty flavorless. Allow the container to cool for a while before placing it in the refrigerator. Cooling can be sped up by placing the container in a sink filled with cold water. After the soup has chilled, a layer of fat will form on the surface. Skim the fat off and save it for later. You can freeze some of the stock for use later. I usually add celery and carrots if I have them on hand– but other than that, this recipe is great. I make it with the carcasses after I butcher a whole chicken into nice packs of boneless breasts & leg quarters. Works every time! This is just what I was looking for. Thank you! It sounds easy and wonderful. 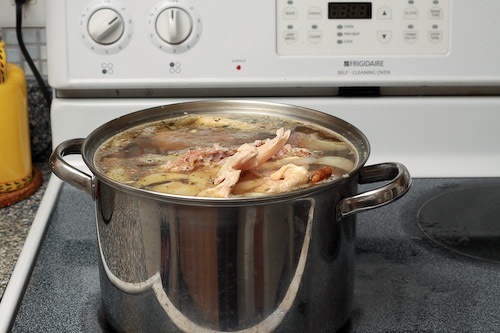 broth = having bones AND meat sit in for long pd of time….